The performance of any component depends on the surface finish which helps in proper working of the assembly. To achieve the higher machining rate which gives the adequate surface finish is crucial. 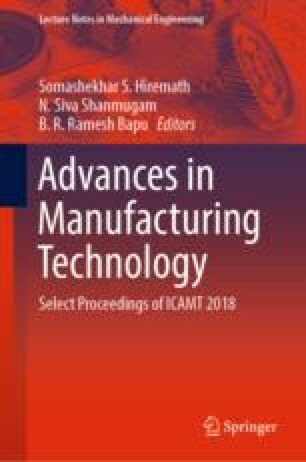 This research work is concentrated to find the optimum turning parameters which end up with higher metal removal rate and better surface finish for –polytetrafluoroethylene (PTFE) polymers which have broad applications in the field of petrochemical, electrical components, food and beverages, bearing pads and laboratory components. The Central composite response surface methodology based 31 number of pilot experiments conducted by considering the cutting speed (v), feed rate (f), depth of cut (ap), and coolant flow rate (Cf) as input machining parameters. The analysis of variance is used to prove the adequacy of the quadratic regression model of output responses. Gray relational analysis (GRA) and Technique for Order of Preference by Similarity to Ideal Solution (TOPSIS) algorithm are used to get the optimum parameters, and the results are compared.